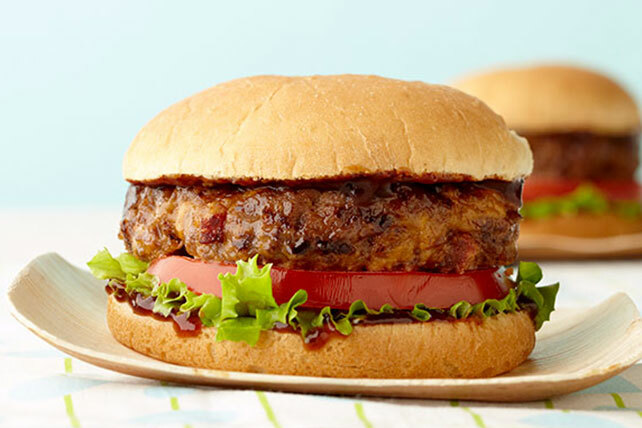 Find out why folks say our Sizzlin' BBQ Bacon Cheeseburgers are the best they've ever had. Sizzlin' Barbecue Bacon Cheeseburgers are more than they seem! Mix first 4 ingredients; shape into 8 (1/2-inch-thick) patties. Grill 4 to 6 min. on each side or until done (160ºF), turning and brushing occasionally with 1/4 cup barbecue sauce for the last few minutes. Spread buns with remaining barbecue sauce; fill with lettuce, tomatoes and burgers. Meat patties can be made in advance. Refrigerate up to 24 hours before grilling as directed.